We are back at it, time for the week to start! I typically spend Monday cleaning up the tornado that is a weekend with a family of 5. My home is pretty much 100% kid friendly, but there is still a lapse in maintaining and it needs a good scrub down. Luckily I have always decorated with my kids in mind, otherwise my job would be twice as difficult. 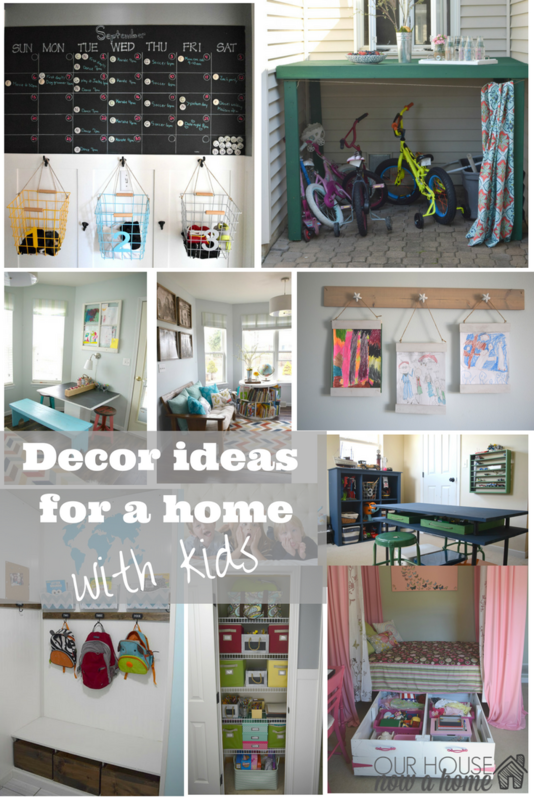 Today I am sharing Decorating ideas for a home with kids mixing up some of my ideas with ones from fellow parents and a few bloggers as well. This is not a post about best baby proofing ideas or best locks for the toilet seat cover. Nope, this is for the pretty side of a home. The safety measured have been taken, the window blinds cords have been tied. Now what do you do? How to do you continue to maintain the balance of a home for adults and kids? 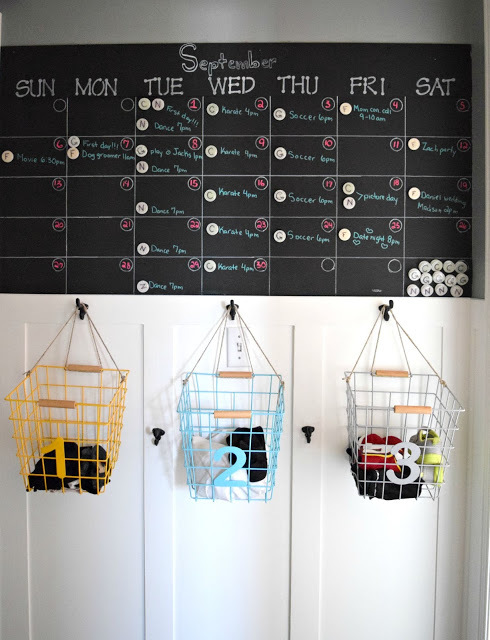 Here is how you stay organized, make your home functional, hide those toys and keep your sanity. Having an oasis for parents to feel comfortable once the kids are tucked in, combined with a home kids feel at ease in and also that it is their home too. I don’t share a lot about my kids here, but our home literally revolves around them. My decor choices are because of them. From the going-all-out holiday decor to every single organization trick I can think of. It is all for them, they are the silent but important main characters of my home. These ideas I am sharing today are all kid tested (and challenged, torn up, messed up and probably crushed with fish crackers) and parent approved. When I say decorating ideas for a home with kids I do not mean all of the decor items put up high, everything bubble wrapped and covered in plastic. This is a quest to make the home work for ALL of the family members, from the small to the tall. When planned right, these ideas will create a home that is decorated and comfortable for adults, but kid friendly. 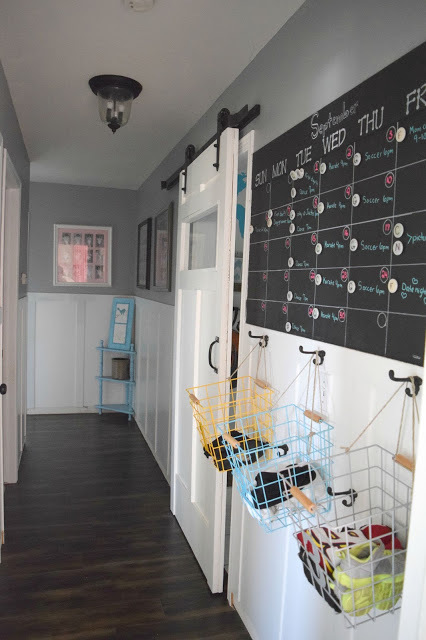 Most of my ideas revolved around planning out ways for kids to get involved in keeping things organized, ease of play, and always hidden storage. In my home the first major “kid friendly” addition (other than covered light sockets, baby gates by the stairs and baby proof cabinets) was the art table. I know, this seems like a recipe for disaster. But I found that once my kids had a designated place to color, the mess at the very least stayed in one spot. I was thoughtful with organization options, ease of use for my littles, and making it pretty enough to fit in with an adult home as well. This art table also doubles as the “kids table” to eat at when we have a party. Yes my kids still make messes. Sometimes this area looks like there was a glitter explosion, but this is what childhood is all about! 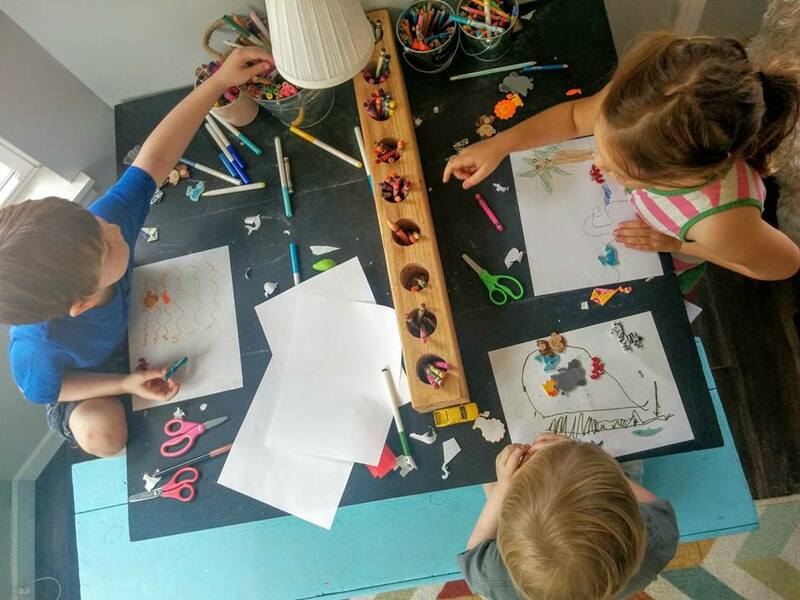 Kids are messy, loud, creative, and so much fun. My home needs to work for all involved, including the kids. If my home was a stiff and boring place with no kid friendly zones my kids would not feel comfortable in their own home. Which is a no-go for me. Of course with art comes needing to display that art. The refrigerator can only hold so many masterpieces, and Grandparents oohh and ahh with a limit too. So having some easy ways to display art work from your kids is important. Having it be easily interchangeable is a big bonus. My kids love adding a new piece to this magnet frame, they feel like they are contributing to the decorating of our home. Which I adore, every corner of this home was created and decorated to make it more comfy and homey for my crew. Their art just adds to that. Storage, storage, storage! I asked some blogging friends and a few fellow parents what their key tip is to decorate with kids and it was unanimous to have storage! Some cannot have a full closet devoted to art supplies like I am fortunate enough to have. But, even capitalizing on some of the ideas can improve your homes function with kids. I created a color coded system for my kids to know what supplies they can use. Green being full use, yellow means slow down and ask a parent, red means stop, do not pass go, do not touch the paints without parental supervision. This idea works great with toddlers who can have fun with the color game too. Teaching the kids responsibility and that they have a need to keep the home picked up is a great skill. This encourages them to be aware of messes now, so they will be better adults and partners in the future. My kids pretty much handle this closet, I check on it occasionally to make sure they are maintaining the plan, which they do-ish. They are kids, not unicorns :). Jess from Domicile 37 supported my idea of kids helping with the upkeep of the home when she said – No glass coffee table! 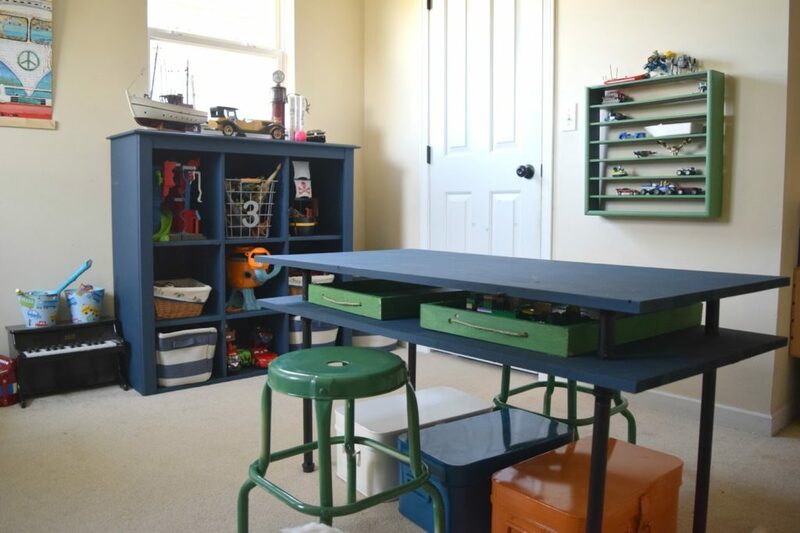 Hidden storage and encouraging your kids to be responsible and help keep your home tidy. Also pointing out a very practical tip of no glass table. For sure great advice! 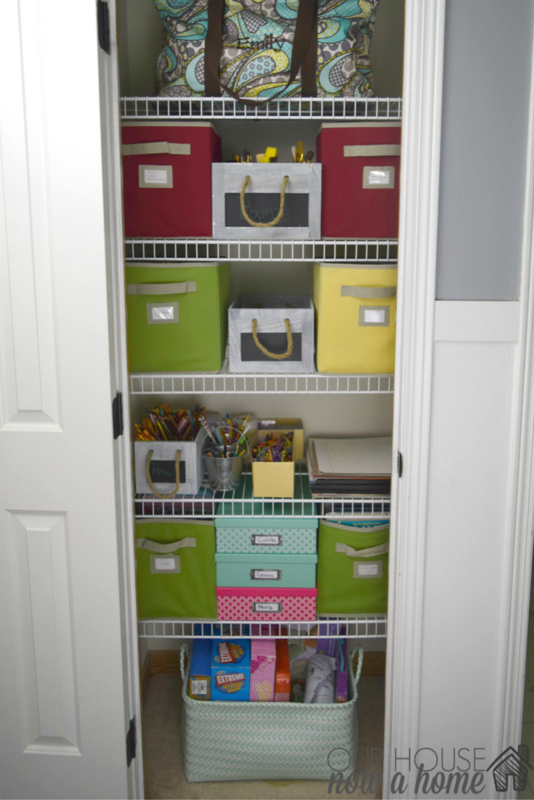 Keitha from The Bajan Texan mentioned hidden storage as a staple – Hidden storage is a must when decorating with kids. 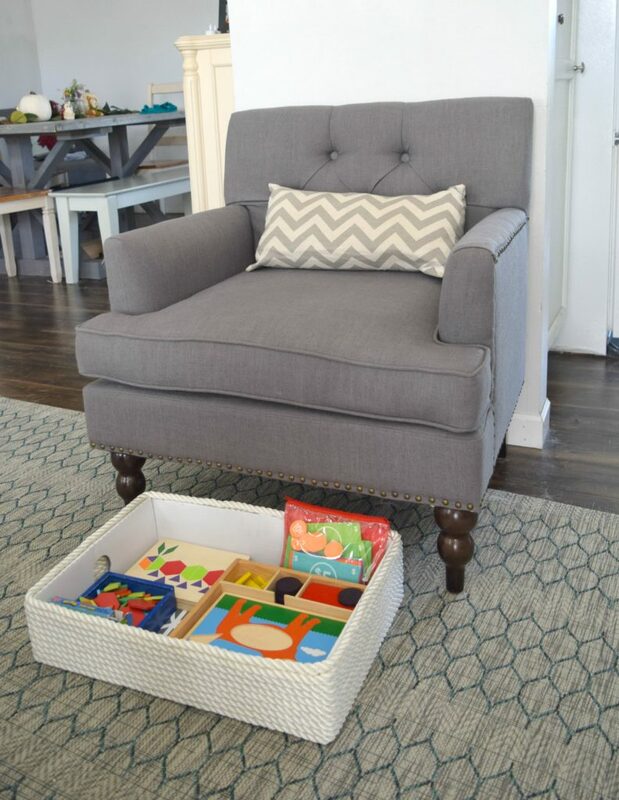 Storage ottomans and side tables with drawers are perfect for hiding toys and books in plain site. 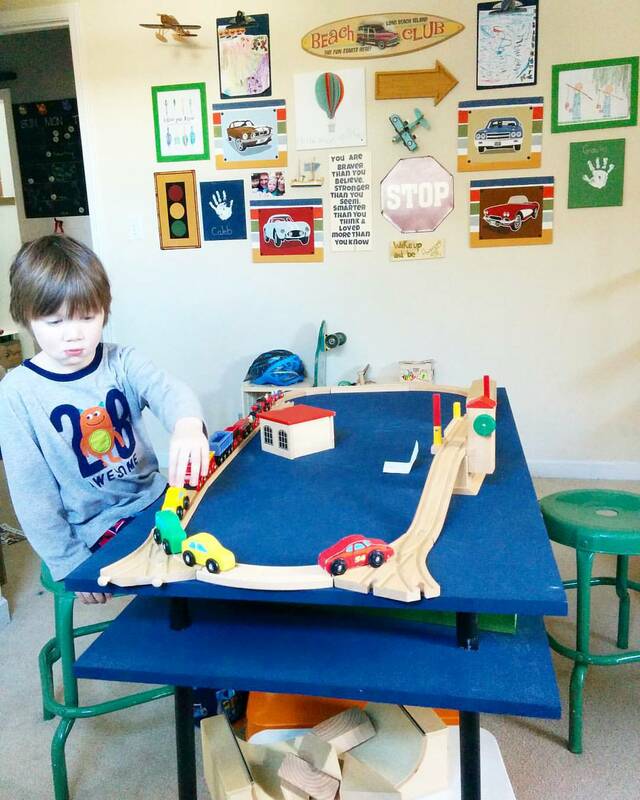 This cardboard box turned into hidden toy storage is a great example of using what you have. Nothing fancy needs to be done to hide those toys, just a cardboard box and some rope! Another point about decorating the home is the furniture itself, Kathryn who blogs at Up to date interiors had this to say – If you have smaller children, I am sure you have thought about the shape of your furniture. “Captain obvious” says to try to avoid hard corners and edges. Upholstered and/or round shapes are two great options for coffee tables. Poufs are also a great way to add style to your room and kids love them. 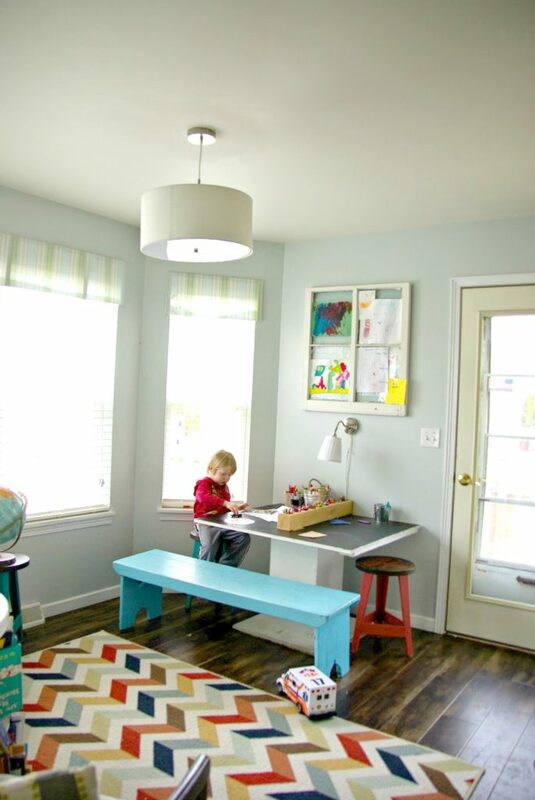 She also wrote a post about how to decorate with kids and brought up some valid points on furniture placement, types of fabric that are best with kids, and also making sure the furniture is safe. These are great points that she highlights that are different from the ideas I am sharing. A great read if you are looking to plan out your home even more. As I said, storage was mentioned a lot! My cousin Audrey who has a little baby already knows the struggle of keeping those toys or other baby items from overtaking the home. I also had another Mom, Melissa say – Using every space available that is otherwise unused. Every inch of the home needs to have a purpose otherwise no home will be big enough! Girl, you are preaching to the every-space-needs-a-function choir. It is pretty much my bread and butter around here. I created this wood pallet storage under Nora’s bed and it keeps things clean, prevents toys from being lost to the abyss that is under the bed, and is cute too! Another friend emailed me and said – A place to relax and be quiet, for each child. Preferably not their beds, but a little nook for them to read, relax and slow down. I love this idea so much! My kids are loud, crazy and have so much energy. But they do seek out that quiet time for themselves. Having a place tucked away for them to be able to do just that is a great tip. 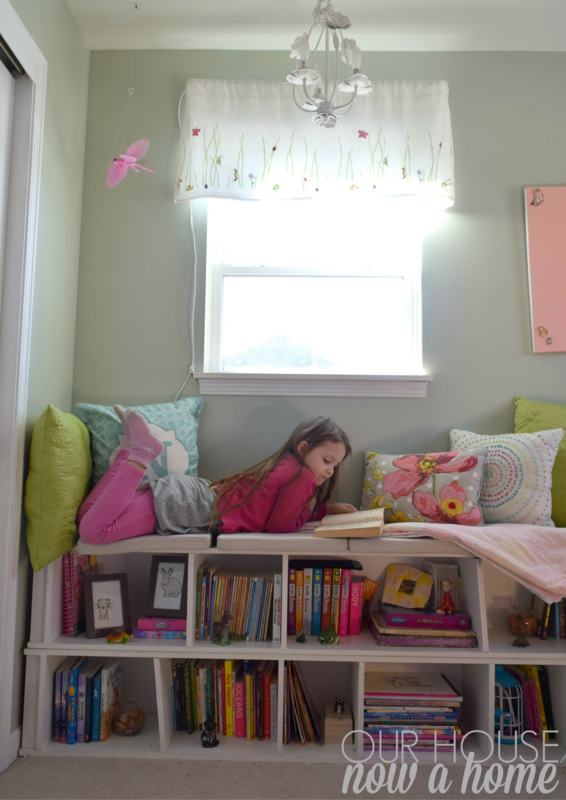 I created this reading nook/window seat for Nora and it hits two points for these ideas to decorate a home with kids; storage as well as the needed quiet space. Hidden storage is needed indoors and out. 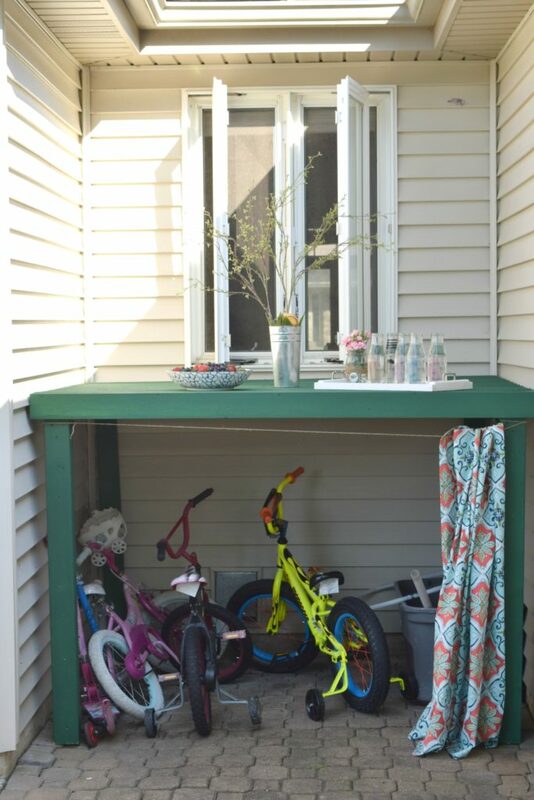 I created this “kids garage” for our patio area and it keeps the kids outdoor toys organized as well as hidden when we are entertaining. My kids seem to do good with putting things away as long as everything has a place. Otherwise they become kid zombies wandering around with a random toy in their hand grunting and eyes glazed over. Not knowing where to put it and eventually giving up, dropping the toy on the ground and moving on to something shiny that caught their eye. Amiright?!!!! 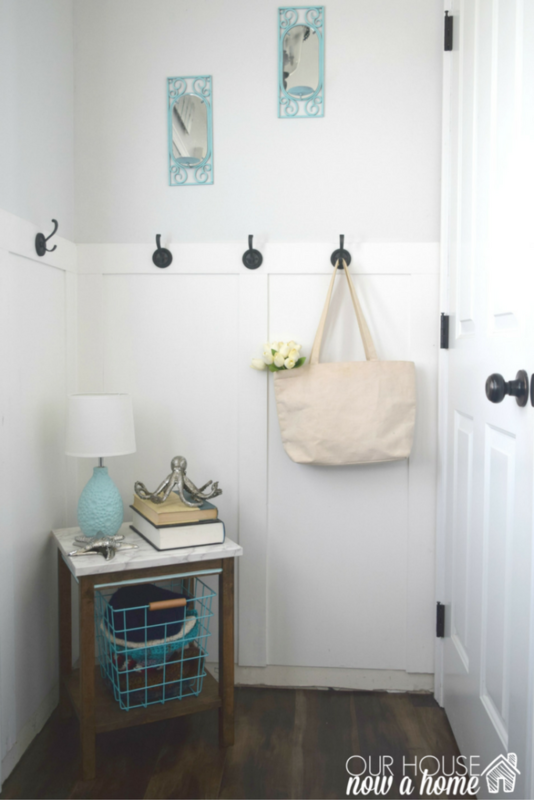 While a legit mudroom is not key to a functional home, contrary to what Pinterest may make you feel. Having a place designated for backpacks and any homework is a big deal. I did fine keeping it all together when just one was in school. Throw in two more and backpacks would trip people, weekly homework would be forgotten, library books would be lost, my kids would loose their homework, inevitably do bad in school, not get into college and live in our basement FOREVERRRR. Possibly a little extreme of a future, just they way my brain goes. All joking aside, this organization station that I created out of one corner of our laundry room has saved school papers and calmed many potentially chaotic mornings. The kids schedules can get crazy, even if you have banned extra curricular activities. There is still birthday parties, themed dress up days at school, gym days, bake sales and other kid-isms that can get difficult to keep track of. 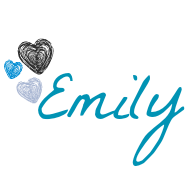 I am old school, much to the frustration of my tech savvy husband and like to write things down. I created this hallway command center which was previously unused space. Having one on the wall like this also helps my kids be involved with their schedule. They can see when their library day is, making them accountable for their actions. Possibly encouraging that independence and one day (maybe) them not asking me every little thing. Wall hooks, when in doubt put some wall hooks up! Also any furniture with a storage area is always a great addition to a family home. I used this small table to put some winter hats by the front door. With a family we need quick and easy with items. Grab a hat and get out the door! Obviously the kids bedrooms are the first place to go all-out kid friendly. Creating an oasis and safe place made just for them. 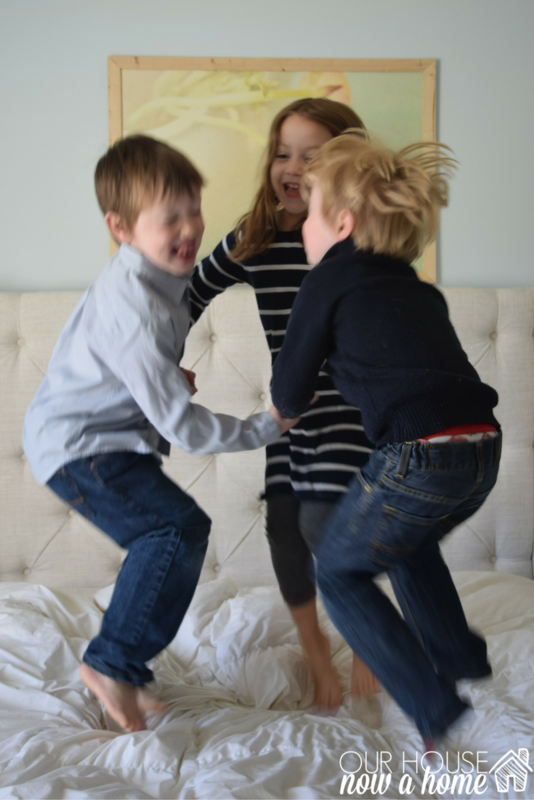 I always focus on what their needs are in their bedrooms, with playtime, rest, and even sleep. My boys’ bedroom and Nora’s room reflect that thought process. Let’s break it down just a little more; I made this Lego play table and storage for Caleb & Gavin in their room. It combines a play space, storage, and even encourages clean-up. Having a place for them to put everything prevents that dreaded kid zombie I was talking about earlier. Susan who blogs at Love of homes said – as a mom of three I’ve always been mindful of them being able to play and not worry about the house looking perfect. We have big storage ottoman that my son hides his Legos in! He loves it and it keeps them out of sight when he’s not using them. Baskets are a staple here too! All shapes and sizes anywhere they can function and still look pretty! 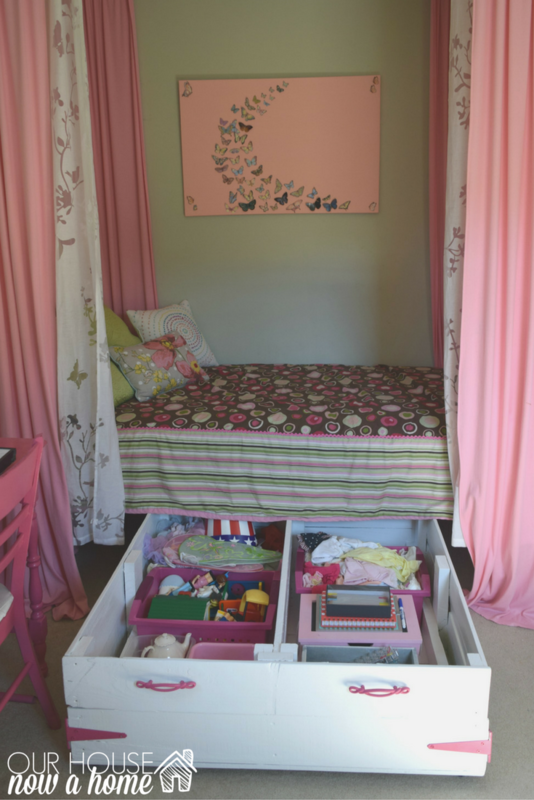 Her tip on using furniture for storage is a parent staple in a home. I also loved her mention of kids not worrying about having the house perfect, kids are only this small once in their life. Before we know it the days of a row of cars down your hallway, giggles in the kitchen, pretend lava on the floor and the only protection is the throw pillows to step on. This is life and most importantly this is childhood. Which is why I am very mindful of how I decorate to encourage play and fun, but also keep my sanity! My kids use this home, this is theirs too. Decorating ideas for a home with kids is something so important, with a little planning and some well placed hidden storage you can have a home that is comfortable for kids but also comfortable for adults. No one wants to feel as if they are relaxing in a large, full-home kids play room. But, kids cannot co-exist in a sterile and too adult space either. Finding a way to blend those two needs is a way to truly create that family home. My kids are the life of the party, professional mess makers, bed jumpers, art creators, book readers, fun to my day. Honestly they are my true home. I know every other parent feels the same way. Kids are the best excuse to move the coffee table to the side and have a dance party, have a full scale hide and seek game going on, movie marathon, or fort building. This home that I thoughtfully decorate is our safe haven, it is where childhood memories are being made. Not sweating the small stuff or forcing them to be mindful of keeping that “perfect” home is not a good thing. However, lets be real and admit we all need to function, get to work on time and have the kids take what they need to school. We all need to shove toys out of eye sight quickly when someone stops by. This is life, and having a home with a few of these key features will be the happy medium between fun, practical, organized and pretty. 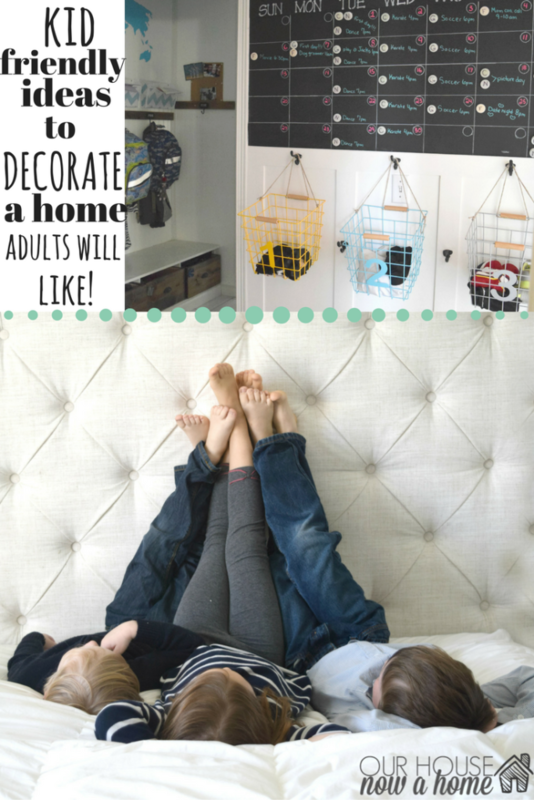 Decorating ideas for a home with kids seems almost as if those points are on opposing sides. How do you decorate a home with kids? You don’t! You get the cheapest possible furniture, cover it with plastic, keep all valuables locked away, and hunker down for the next 18 years with Disney channel on loop and snacks at the ready. Or you take some of this advice, do a little planning, figure out what works for your family now and enjoy your home together. I know as my kids get older our needs as a family will change, so like life; my home will transition as well. We are still in the cheap furniture, toys hidden everywhere, tiny shoes missing, forts being built in the living room stage of life. I know once I have teenagers (gulp) I will laugh at my cute ideas of bins and color coordinated art supply storage. These will all feel simple in comparison. But for now this is where we are, this is where our home is and most importantly…. this is where my kids are growing up. I make it work for them and create a space that still feels adult enough for Dale and I to relax on our sofa. We just have to dismantle the fort in the living room, move a stray toy or book to get comfy on the sofa. Then we sit back, enjoy the evening and get up 10,000 times to tell the kids to go to sleep. No one said parenting was easy, and creating a home for the comfort of everyone is about the easiest part of parenting. When in doubt, bins, baskets, and storage! Also splurge on an expensive sofa once the kids are out of the house. What are some tips and ideas you have used to make your kid friendly home function better? How do you make it kid and adult friendly? I secretly crave new ways to organize and love all these ideas! 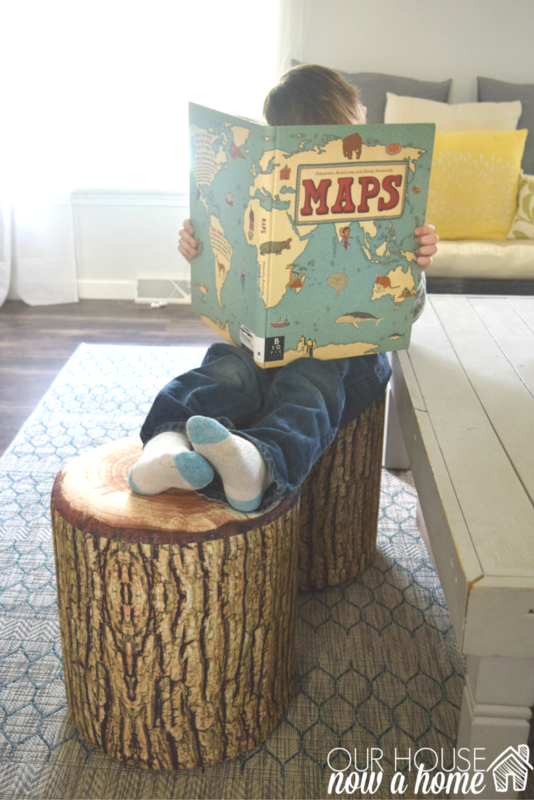 Those tree trunk stools are beyond adorable. I felt like I was in a constant state of organizaitonal re-engineering when my kids were little. I use lots of baskets! They are great for “hiding” toys but still looking nice. These are such great tips! Baskets are my favorite secret weapon for keeping our home looking semi-organized. I had no idea how much stuff I would accumulate after having kids. These are all wonderful ideas. Storage and organization are the key! These are all great ideas! When my daughter was younger, she was involved in so many activities we had to set up a “command station” to keep track of everything. So many great ideas! I love the hallway command system so that everyone knows where they are supposed to be! I also like the idea of no dining room. Clear out that clutter! I love the craft hangars, so great! I wish I had these tips 8 years ago! 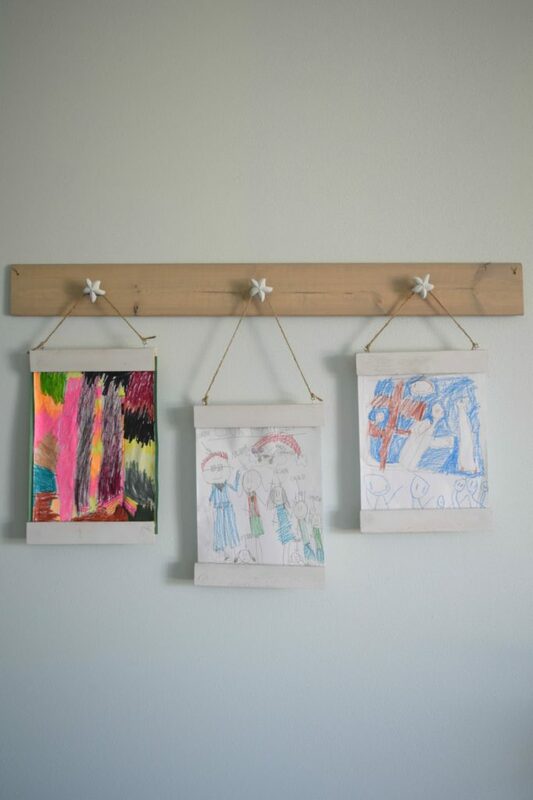 Awesome way to keep the clutter low, but make it functional for the kiddo to be in your spaces. This post and the photos make me swoon! I really need to step up my decor game! We do have a little kids/art table that we picked up from IKEA with a nice rug underneath and it makes a huge difference! I love the baskets under the chairs! What a great idea. Kids can quickly put away the mess, too. Adorbs, please come organize our playroom???? No real tips here, I always go for comfort over style. My youngest plays with trains all the time and always tries to leave a path for us to walk but if I have to I hop over. I absolutely love these ideas and some I will be able to incorporate in my home. It’s just the two of us, but our house is small. Between her stuff, my stuff, and all my blogging stuff, we have a lot of STUFF. It needs better storing ideas. Thank you. Never thought I’d say that hooks in our mudroom would be one of my favorite things about our new house…but I am. I love chucking all the backpacks in there and loose umbrellas, hoodies, etc…everything is in one spot where we can get it and head out the door. Plus…I can shut the door and no one has to SEE it. These are all great suggestions. Staying organized is a big deal around here, so we have a lot of storage bins and containers. I love everything! What wonderful ideas for the “littles”. Your home is so inviting and warm for people of all ages! I love the hanging art pieces! How genius! 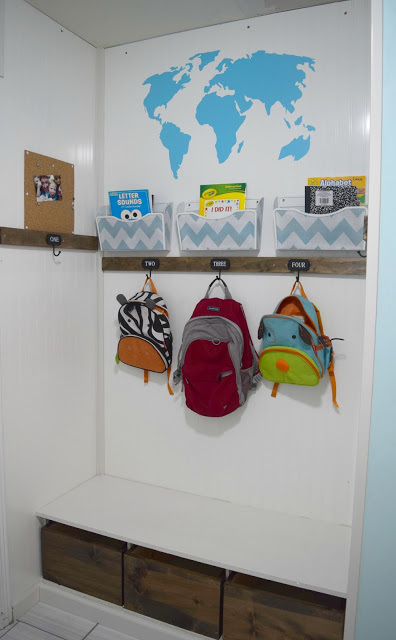 I love your creative storage ideas and your adorable kids! I always feel like I’m drowning in kids toys! Love your ideas for storage, can’t wait to try them. some good ideas for sure!